The Sony Xperia Z Ultra is so big that its gravitational field can be detected from as far away as the crab nebula. Dust particles less than 6 inches away get trapped in orbit around it, and scientists are currently trying to work out whether when it dies it'll collapse to become a black hole or explode as a supernova. What we do know is that it's so big that it leaves the comparatively puny Samsung Galaxy Note range quantum foaming at the mouth it's the most potent smartphone this side of the solar system and so far we're very impressed indeed. Whether anyone will buy one is another matter, of course, but in our initial tests it seems like a fantastic device. 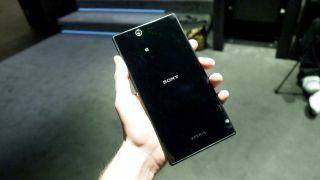 The Sony Xperia Z Ultra is a phone that wants to be a tablet. While many will look at the Ultra and recoil in horror at its larger dimensions, those that want the larger screen won't be able to help but desire this handset. Is it going to win over more of the smartphone market? It's a definite possibility as the power and size combination are currently unique. More importantly for the long-term future of Sony Mobile is that this handset shows that the Japanese brand is keen to show it's at the forefront of technology. Spec-fans will be unable to contain their excitement at the thought of the first smartphone with Qualcomm's Snapdragon 800 chip, a quad-core processor clocked to 2.2GHz. It's also got a magnetic charging port on the side to facilitate, well, magnetic docks that allow charging - it's odd that it takes up so much of the design though, where it's usually more discreet. Samsung reckons its solved the Windows 8 / Android conundrum: stuff 'em both in one device. But this isn't just a case of plopping in dual booting modes and letting the world work out how to get from one to another – both are operating from the same Intel Haswell chip and as such seem to fly along in both guises. The design of the Samsung Ativ Q is impressive: with a 13.3-inch screen, it certainly feels more laptop than tablet, but the superbly high resolution display (QHD 3200x1800, which equates to a 275ppi) means that you'll be more than impressed whether you're checking out Windows 8 (the full-fat version, not the confusing Windows RT some users will have encountered) or Android 4.2.2. There's plenty to like about the Sony RX100 Mark II, from its small, pocketable size to its excellent image quality. We're most pleased about the improvement to low light performance, which is significantly better than its predecessor, thanks to that new backlit sensor. Putting aside our disappointment about there still not being a touchscreen, we're still a little bugged by the functions that can't be shot in raw format, leading to some pretty tedious menu diving. Still, if you predominantly shoot in JPEG only, this shouldn't be too much of an issue for you. Ultimately, with a raft of welcome improvements, it's fair to say that the Sony RX100 Mark II steals that crown now, making it incredibly worthy of your lust. Windows 8.1 isn't a whole new operating system: it isn't the same leap as Windows 7 to 8. But it's more than a service pack as well. Built-in SkyDrive sync is very welcome – and transforms Windows RT 8.1 into a far more powerful system. Internet Explorer gets some significant improvements, on the desktop and in the modern version, too. Performance feels generally faster, even for simple things like zipping up files. The interface changes won't please everyone, especially if you liked the Windows 8 Start screen and don't feel you need for yet another Windows key on screen - or if you were hoping for the Windows 7 Start menu back.